One of the things that makes me most happy is to do things for and with my family to make them happy. While there are lots of small, everyday things that I do to make them happy, I also love to do bigger things, too. I love to plan and have holiday meals and other family gatherings where we share time and make memories. I was able to plan one of those larger things recently for my DSH. A larger thing that was on his bucket list. 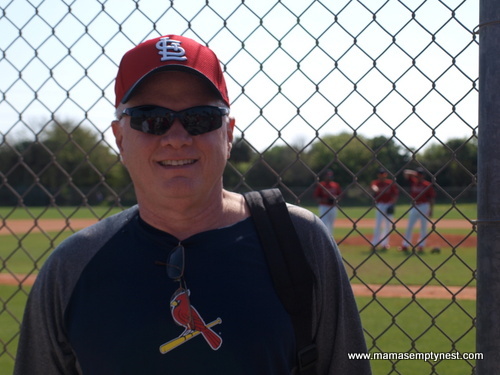 His bucket list item was a trip to Jupiter, Florida, for Cardinals Baseball Spring Training. 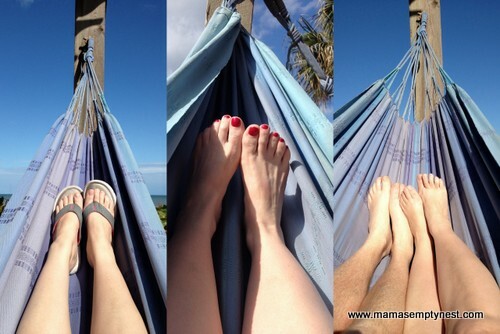 And after a winter of brutal cold and snow, we were ready for southern Florida sun and warmth! We packed up the car and saw lots of interesting sites along the way! 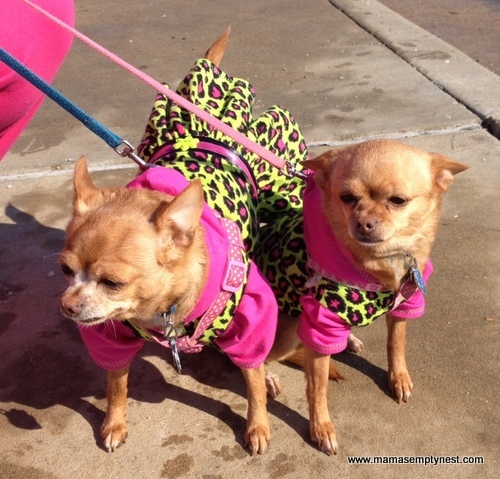 Like this mother and daughter Chihuahua pair dressed alike that we saw at a highway rest stop! The further south we headed, the warmer and greener it got. 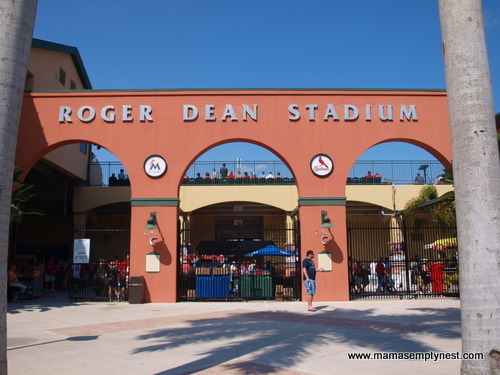 After two days driving and one night on the road, we arrived in Jupiter and headed over to Roger Dean Stadium where the Cardinals and Marlins share Spring Training facilities along with their minor league teams. I am not a big sports fan, but I have to say that I loved this adventure. Anyone who even has a remote interest in baseball should take this trip. The fans were so friendly. It was like watching baseball and sharing stories with one big, happy family. People, even those from opposing teams, were anxious to introduce themselves, share where they were from, and tell stories of baseball celebrity sightings. We saw two Cardinals players at a restaurant on our first night in Jupiter. No, we didn’t ask for autographs or take any pictures, but DSH was very excited. There is not a bad seat in the house at Roger Dean Stadium, but the two games we attended were sold out to standing room only so if you go, buy in advance! We went to Arizona Diamondbacks Spring Training a few years ago and the players were much more accessible for autographs than they were at the Cardinals camp. DSH went down to the stadium early each morning to watch the various groups of players practice. He is a sports guy and baseball is his favorite sport so he was in heaven. He found out that the best way to get autographs is to get there early and wait along the fence for hours. Needless to say, we didn’t get any autographs. 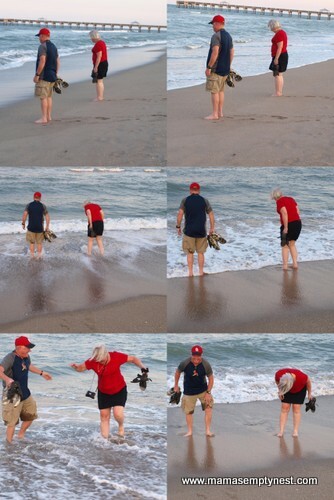 We visited the beach in Jupiter and DSH and my sister chased waves. And got wet. Very wet. It was a joy to me to hear my sister laugh out loud and long. It’s been a tough few years for her so this was cathartic for her. 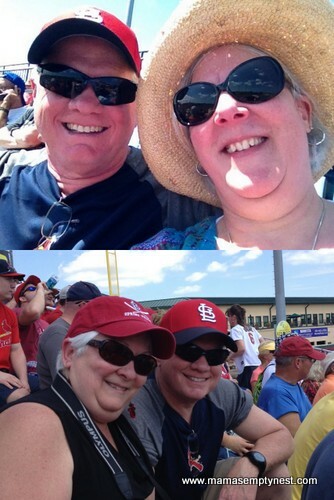 We saw baseball. We saw the beach. And we ate some awesome seafood along the way. We love to find out-of-the-way, local spots to eat. We got a great referral from a lady walking her two yellow labs on the beach. Seriously, why eat at a chain restaurant that you can go to at home when you can find great local cuisine with local food where you are visiting? 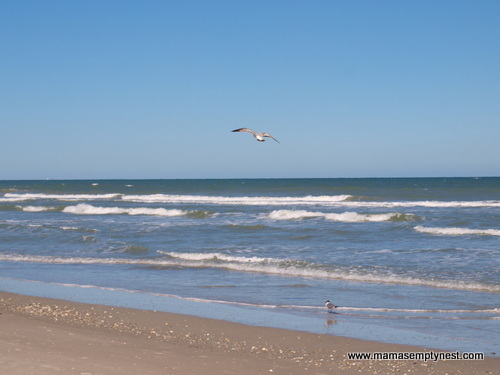 We ended our trip by making our way up the coast on the scenic route to Cocoa Beach where I had found a little out-of-the-way place right on the beach. It looked a little sketchy on the outside, but once inside, we found a lovely full-service condo-style room that opened out onto the beach. The place was filled with pergolas and sitting areas and fire pits and BBQ areas and water fountains and objets d’art. And plenty of hammocks with room enough for two. Perfect. 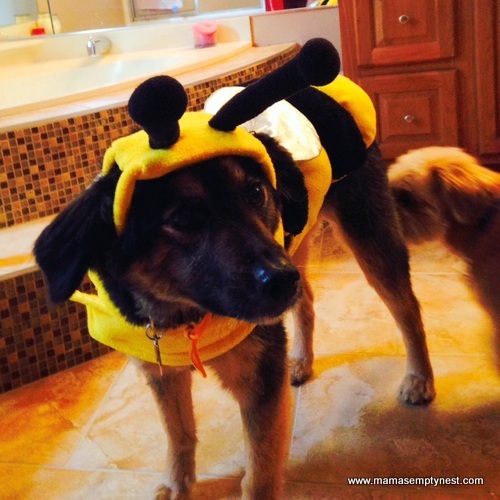 Back home, our poor dog was being tormented by my niece and her husband who were dressing her up as a bumble bee. We left Cocoa Beach and drove through the night after making a stop in Montgomery, Alabama to pick up a kid who went down for Spring Break, and arrived back home at 3:30 a.m. It was a long trip. The dog was happy we were home. I was happy to make this trip a reality for my DSH, but I wasn’t so happy to be home. 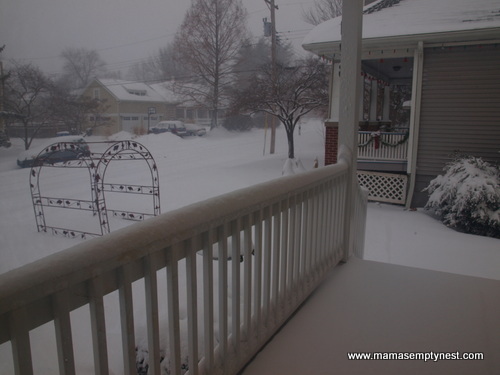 We arrived just in time for more snow and cold. Come on spring and summer! Theresa – this was a darling blog. Thanx for sharing DSH with us, too! You’ll have to share your preparations for this trip some day, ok? Would love to share our tips for planning this trip! Sounds like a great trip!! I would love to go one day. 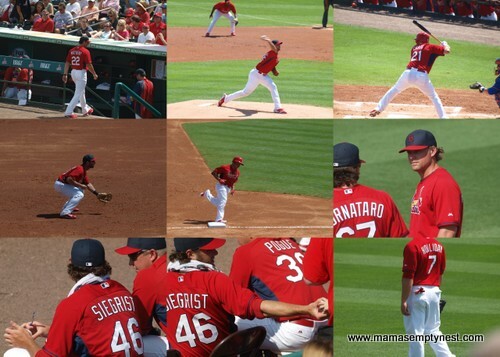 If you like Cardinals baseball, then this is a trip that you have to take. Can’t tell you how much fun it was and how friendly everyone was. We met some great Detroit Tigers and Mets fans. People were just wonderful. I love the beach and wish we could have spent more days there, too. Poor Roxie hated the bee costume. She is happy to be back in her routine. We have found some great gems this way! And we like getting to know people, too.